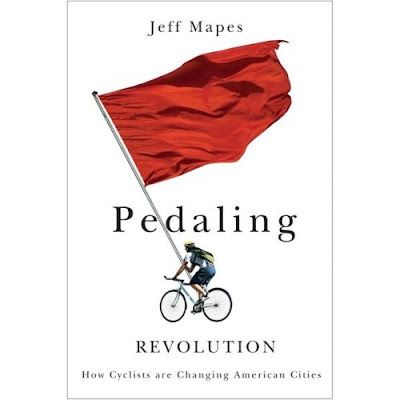 I just finished Pedaling Revolution:How Cyclists Are Changing American Cities by Jeff Mapes. He looks at how bicycle transportation for everyday use is wheedling its way into American culture and changing it. It also looks at the European street systems used to promote bicycling in countries like Holland and Denmark. Mapes is a political writer from Portland, Oregon and sometimes the book drones on about the nuances of local politics (which after four years of journalism training, I can't stand). Good thing there's no law saying you have to read every page of a book. 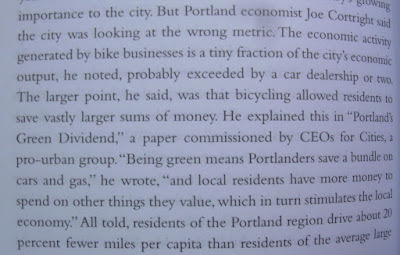 This is absolutely worth reading for the interesting parts about saving money, enjoying your commute, and pointing out interesting facts and people involved in the cycling movement. I was even inspired to ride my bike every day to my first week in my new job. The office is only a few blocks away from my house, and I worry about my bike getting stolen (I lock it up in the parking lot behind some cars) but its actually quicker to ride my bike than to drive because of auto traffic. In the book it points out that people who ride in Europe don't bother with the weather or specific clothes for commuting by bike. If they can ride with an umbrella in the rain, so can I.
Oh, that book sounds interesting. Thanks so much for the perceptive review of my book. I rode home tonight in a light mist in my shirt and slacks (I had neglected to take even a rain jacket to work) and it was No Big Deal. I was dry within a few minutes of walking into the house.